The mid-to-late 19th century saw the widespread manufacture of readymade clothing for the first time in Britain. Different regions of the country had different specialisations; for example, most felt hats were made in Stockport, most cotton shirts in Manchester, most leather gloves in Worcester, most shoes in Somerset and most hosiery in Nottingham. 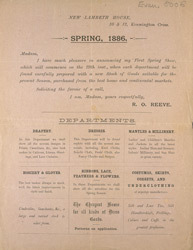 These goods were produced, packaged and sent to large department stores, such as this one, in large towns and cities. Each item would have had a label stitched to it, identifying its provenance and manufacturer: this was both a guarantee of the garment's authenticity and a failsafe should a delivery be missed or lost.